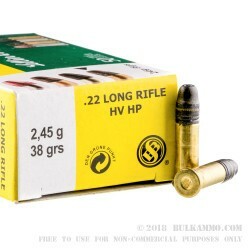 Perfect for ridding yourself of smaller-sized game, this Czech-made S&B hollow point ammo is designed for just that purpose! 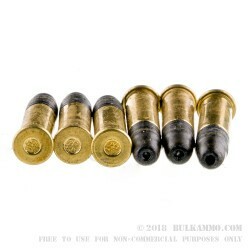 This round's high-velocity load combined with a non-plated lead hollow point bullet designed to expand quickly upon impact make sure that these rounds will quickly bring down whatever target you hit. Sellier & Bellot also has a great reputation for accuracy and quality, and these rounds are no exception. We often hear good reports of tight grouping with this ammo. These rounds may have a protective coating for the long voyage over from Europe, which we recommend wiping off with a paper towel as you load them into your magazine or chamber. 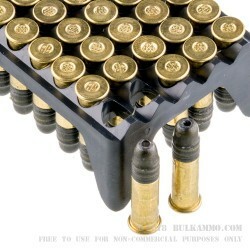 These rounds work great in bolt-action rifles and revolvers, and also cycle in most semi-automatic handguns as well. Q: What is the velocit of this ammo? 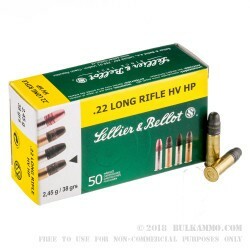 A: Hello Henri, The Sellier and Bellot .22 LR ammunition has a muzzle velocity of 1230 fps.